Phew! I am so glad to be relaxing on the couch! I had a super-busy work week, and last weekend there was no time for resting as we were in Tasmania! I absolutely loved it, but with all the travelling around (including a mammoth drive from Launceston to Cradle Mountain and back again), I think I needed an extra weekend just to recover! After sorting through the hundreds of of photos we took I'll definitely be blogging about the trip, so stay tuned! Also coming up will be lots of the things I've been cooking and baking at home. As you will have gathered, much of what I've been cooking has come from the absolutely fabulicious Kitchen! I'm not even going to attempt to re-create the epic efforts of Sarah Discovers How to Eat, but I'll sure give it a good shot! If you want to keep up with my cooking from Kitchen, simply click on the Nigella Kitchen icon on my sidebar, and it will bring up Nigella Kitchen posts. This is only the 3rd so far, but there will be more! So speaking of which, the crustless pizza you see above is the 2nd recipe in the book, from the What's for Tea? chapter. 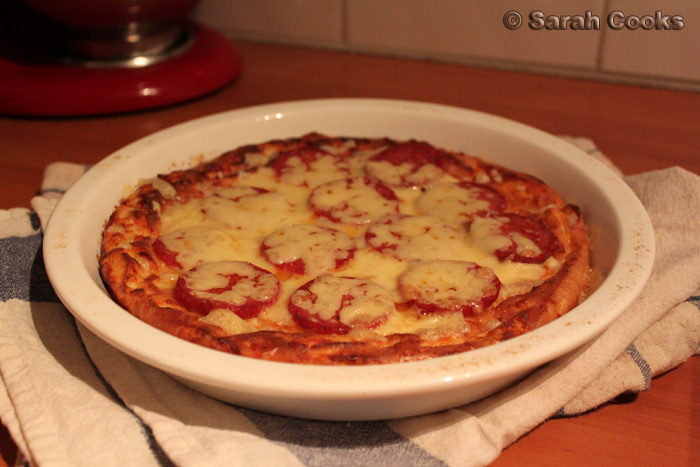 I made this for dinner last night, when I was too lazy even for a takeaway pizza. And it's funny that I chose a crust-less pizza on what is known around the Twitterverse as Crust Pizza's free pizza Friday! I always mean to enter that competition, but by the time I remember about it, it's past midday and the comp is closed. Oh well. Nigella's recipe is even easier then getting takeaway - no driving outside in the cold! 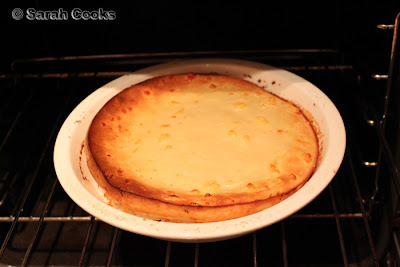 You start with a simple batter (like Yorkshire pudding - just flour, egg, milk and salt), add some grated cheese and cook it in a hot-ish oven for 30 minutes. ... and put it back in the oven for a couple of minutes, until all hot and crispy. The pizza was super-comforting and delicious. It was quite crunchy around the edges, but the middle was very, very doughy. I loved the doughiness, but then again, I also love soggy chips! I think that more normal people would prefer it to be more cooked. Perhaps a wider dish or less batter would help. You can actually top it with anything you like, and I think some trashy sliced champignons (from a tin, of course) would go perfectly! This morning I actually bought a couple of tins, just for this purpose, hehe. Nigella says the recipe will feed "2 - 4, depending on appetite", and she is referring to children eaters. For grownups, I think 1 pizza will feed 2. But we were hungry... and the batter is ridiculously easy to make. So I made another one. 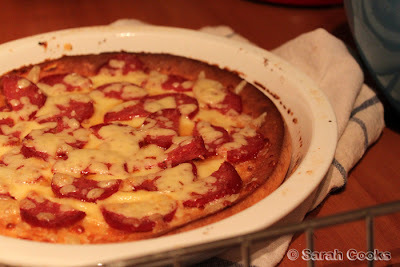 You can see that this one rose a lot more than the first pizza and came away from the sides. I think this is due to the dish being hot when the batter went in. We only managed to eat about half of the 2nd one, so I had leftovers for lunch today. It's not particularly healthy, so maybe it's not the best thing that I've already memorised the recipe! I suppose if you used low-fat cheese and topped it with veggies instead of salami it wouldn't be too bad. 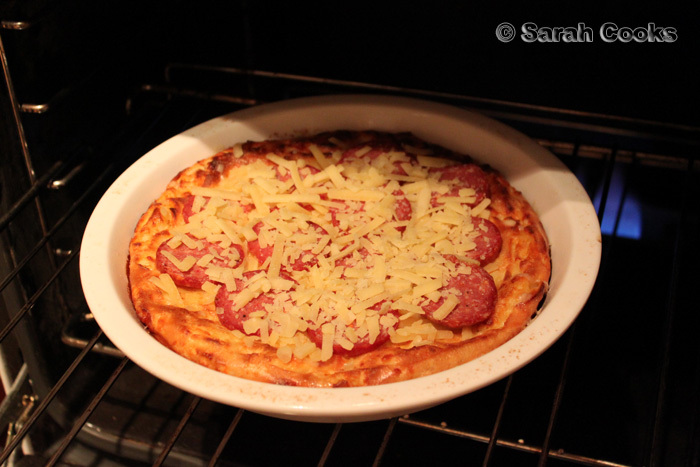 But for a quiet Friday night in, this carb-o-licious pizza was just what I wanted. you sure love your carbs!! I like the look of this pizza... pizza, night in and DVDs. Hehe yup, I'm a total carb fiend! "Pizza, night in and DVDs" sounds like my perfect kind of night too. I've become such a homebody! i love nigellas recipes, she is an amazing cook, did you enjoy tassie? it would have been freezing down there at the moment!! Wow, if all recipes from Nigella are this simple and yet so yummy looking, I'm in! I'm quite ignorant to the charms and beauties of Nigella but I'm slowly learning... through you! @My Restaurants Melbourne - I loved Tassie! I think we were pretty lucky to have good weather (slightly cooler than Melbourne, but not cold or raining). It did get quite cold and rainy when we visited Cradle Mountain, but for the rest of the time it was clear and sunny skies! @Hannah - Wow, you're so much more imaginative than me! I was just thinking tinned champignons, LOL. Fried egg sounds indulgently good! Apropos of nothing (but the pizza looks good), could you check out Churchill's in Hamilton St/ It's just gne form being a very popular local cafe (with very rubbery sevrice) to a tapas bar. I'm dying to see if it's worth getting over being miffed at being refused a coffee unless I also ordered some tapas (at 11 am mind you). When it opened it was trying to also offer a very serious deli service, but they closed that down wihtin a few months; too few locals were into $100/kilo cheeses. Oh alright I admit I'm hoping you'll bag it. Hello from a Hobart reader - looking forward to seeing your Tassie posts! Hey Sarah, I'm a Brit and haven't invested in the new Nigella book yet, but am in the process of watching her TV series to accompany the new book - one featured recipe was MARMITE PASTA?! I was thinking you could make this with VeggieMite? Over here Marmite has the tag line "you either love it or you hate it" - is it the same for you with veggiemite? @Elizabeth - LOL! Most random request ever! :) Sounds pretty dodgy that you couldn't get just coffee at 11am! @Bri - Howdy! I didn't get to see Hobart on this trip (just Launceston and surrounds), but absolutely loved it and can't wait to go back and check out more. @Anonymous - Hehe I've seen the marmite pasta recipe. We don't have the same tagline here for Vegemite, but it's definitely a love or loathe item! I fall into the first category, love my vegemite! 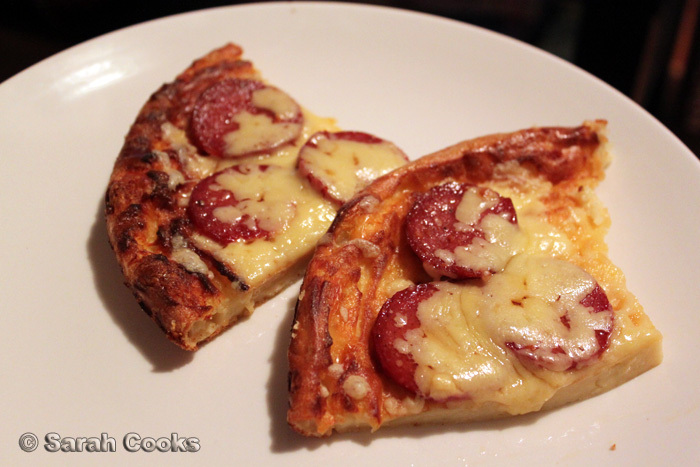 Hannah, my mum doesn't care for pizza either, but she tried one of these crustless pizzas that someone had made at a luncheon and she LOVED it! So much so that she brought a piece home for me to try, so that I could make her one! I made this Sarah and whilst we enjoyed it, I think it tastes more like a cheesy, collapsed Yorkshire pudding than a pizza! :)) it was still good though! 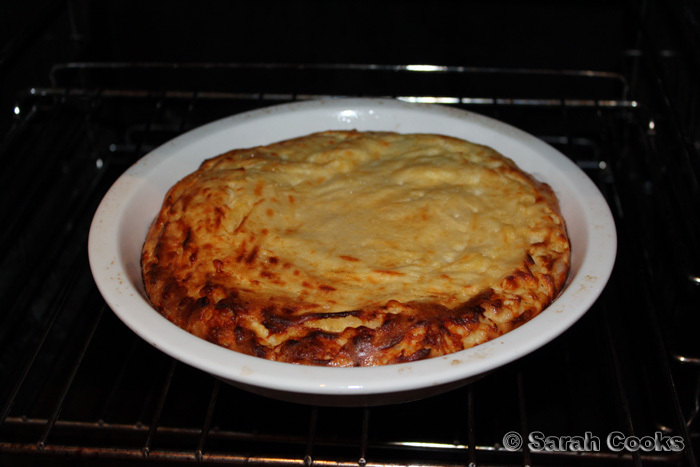 Anna - A "cheesy, collapsed Yorkshire pudding" sounds like my idea of heaven!! !